The month of April has many high points for me. One of these high points is the unique opportunity to give back and be a conduit of God’s blessings to the less privileged. 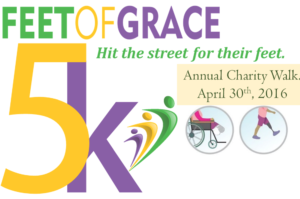 The annual Feet of Grace Foundation Charity Walk, Hit The Street For Their Feet is the event that flags off our fundraising efforts for each year so that we can reach a special group of people–persons with missing limbs. We believe that the loss of a limb should not be a limitation to living full and vibrant life. But for many living in developing countries, it is. 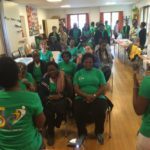 We planned the 5km Charity Walk, Hit The Street For Their Feet 2016, to be held in Geneva as usual. And suddenly, God took over the plans and began to do beyond our imagination. A dear lady who subscribed to my old blog; Touching Lives for Good shared my story with her sister. Her sister came to visit her friend in Geneva and looked for me. She asked if she and her friends could hold the walk in her city since she would have gone back to UK and could not be a part of the Geneva Walk. We thought, “why not?” The rest, as they say is history. 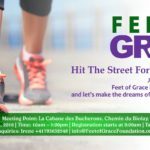 Friends of Feet of Grace Foundation will walk at these locations to raise 25,000 Swiss Francs so that six amputees can walk or move around effficiently again. Christmas was approaching. 4 year old Olamide and his brother were on vacation and were playing. In the course of the play, Olamide’s brother accidentally pushed him and he fell on his left hand. It seemed like a minor injury. But time proved it was not. A week later when his father had to take me to the hospital, it was too late to save the hand. Olamide’s hand had to be amputated a few days before Christmas 2015. It has been a traumatic experience not only for Olamide who does not understand why he no longer can hold things, but also for his brother and parents. She is vivacious and full of life. She is 42 years old. It was two days after her 24th birthday, she was on her way home after making arrangements to celebrate her birthday that weekend when she was hit by a reckless truck driver who was sitting on stool in replacement for a seat. The stool shifted, he lost control and drove straight to where Yetunde was standing and over her leg. In 2000, she got help to go to the UK where she got her first and only prosthetic limb, which she has been using since then till date. She has repaired it too many times, it is overdue for replacement. Yetunde is married and has to lovely boys, age 15 and 12 years respectively. A new prosthetic limb will make a load of difference not only to Yetunde but to her entire family. 60 years old Mrs Odusote had her both legs amputated above the knees on December 15th, 2012. She had discovered an injury on her toe while working in the hospital as a cleaner. The injury did not heal. It was infected and had become gangrenous. Her family were reluctant to have the foot amputated. In the process the toes in the second leg got infected as well, resulting in the eventual amputation of both legs to save her life. She is wheelchair-bound but with boundless energy visiting the orthopedic hospitals to encourage recent amputees. She needs a motorized wheelchair to become less dependent on her family as she pursues her dream to be an encourager. Kareema’s story touches the heart. She is a 32 years old woman. She suffers from Sickle Cell Anaemia. As a result of the complications of this disease, she had a hip surgery to relieve the inflammation in the pelvis. She later developed gangrene in the leg, which led to the amputation of leg. In addition to Kareema’s health issues, she is also burdened with the care of her ill parents. To the extent that she could no longer care for her only son, who had to be sent away to live with her grandmother. Beyond the need for a prosthetic limb, Kareema requires a catalytic support to improve her socio-economic status so that she can be empowered to care for herself, her son and her ill parents. For these amputees, I am committed to walk to raise funds and a make a difference in their lives as the Lord gives me grace and strength. 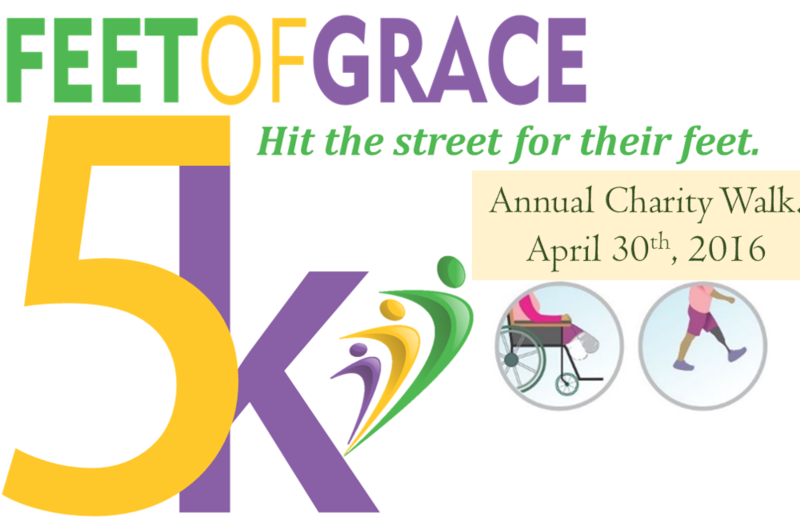 Not just me, there so many Friends of the Feet of Grace Foundation committed to walking on this day. I am on my mark, getting set to walk 5 kilometers, God helping me. You can join us to make a difference. You can support us to make dreams come true for six amputees in 2016. Support us as we walk on Saturday, April 30th, 2016. Let’s raise the funds we need to touch the lives of these amputees for good. Together, we can. I am looking forward to hearing from you.